The sky sparkles above the Grand Canyon National Park, which was just designated a provisional International Dark Sky Park. 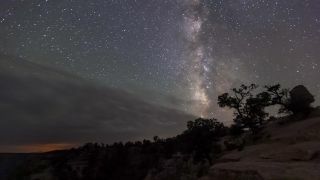 The glittering night skies above the Grand Canyon will soon gain extra protection from encroaching light — the national park has been designated a provisional International Dark Sky Park by the International Dark-Sky Association (IDA) and the National Park Service. "The designation of Grand Canyon National Park as an International Dark Sky Park is an important step in ensuring the Colorado Plateau remains a protective harbor for some of the best night skies in the country," Scott Feierabend, IDA's executive director, said in a statement. The Grand Canyon's application includes an inventory of thousands of the site's light fixtures, which the park will have to bring into compliance with the IDA's standards over the next three years, IDA officials said in the statement. If all goes well, it will attain full IDA Dark Sky Park status on the national park's 100th anniversary. "Our mission to preserve and protect the canyon for future generations is important during the day — and also at night," Susan Schroeder, Grand Canyon Association's CEO, said in the statement. "We are so pleased to support this initiative. Our members and donors are very engaged in helping the park preserve our night sky. We've funded the assessment work and now look forward to funding the retrofitting portion of the project so the night sky is protected for all, forever." The Grand Canyon National Park is in the midst of its annual Star Party, which stretches from June 4 – 11 this year. The park offers slideshows, constellation tours and telescope viewing to visitors during that time. Throughout the year, park rangers offer night sky discussions and walks. Besides operating the International Dark Sky Places conservation program since 2001, the IDA also spearheads the yearly Dark-Sky Week celebration, which raises awareness of how excess light, besides blotting out the stars for skywatchers, harms ecosystems around the world.